A. 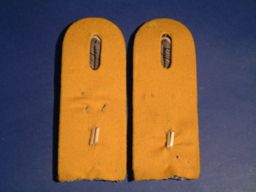 44 PRUSSIAN LEUTNANTS NACHRICHTEN TRUPP COMPANY No 7 SHOULDERSTRAPS. A. 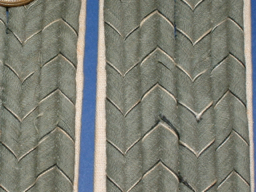 47 PRUSSIAN INFANTRY MAJORS 1870 STYLE PAIR SHOULDER STRAPS 1870 period . A. 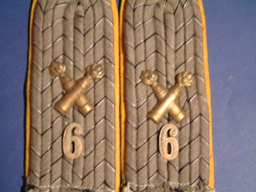 48 PRUSSIAN PIONEERS LIEUTENNANTS PAIR SHOULDER STRAPS ( 7th Pioneer Regiment ). 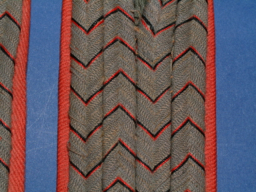 Nice pair of Wurtemberger Officers shoulder straps from the Army... Field grey wire with red and black flecking .... 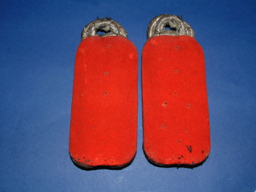 Bright red bases . excellent Slip on types overall excellent condition and in this condition ....rare. A. 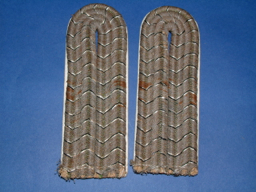 50 PRUSSIAN LIEUTENNANTS FIELD GREY PAIR SHOULDER OF STRAPS. 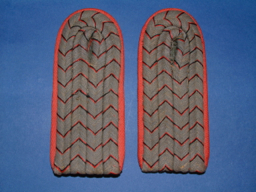 Pair of slip on type Prussian officers straps. White bases with brownish grey wire tops flecked with black and white..In very good condition.. Some staining to the face of straps thus the cheapness of the pair A scarce original pair of extremely rare straps. Nice pair of Bavarian Railway troops Officers shoulder straps from the Bavarian Eisenbann regiment... Silver wire uppers with blue flecking and a large baroque gilt letter 'E' .... Light grey bases One or two moth nips to the rear Tops excellent Slip on types overall very good condition and extremely rare. A. 52 NEW IMPERIAL GERMAN SAXON GARDE REITER HAUPTMANNS SINGLE SHOULDER STRAP WITH ANOTHER GARD REITER OBERLEUTNANTS SINGLE STRAP. These are of early Post 1908 Pattern manufacture. Sew in Type. 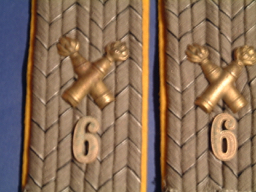 Blue bases Silver wire weave uppers flecked with Saxon green a with gilded entwined AR Crown and two gilded officer rank pips ,Also with an almost identical Garde Reiter Oberleutnant’s strap missing the entwined AR missing. The gilt crown and Oberleutnants rank pip. Garde Reiter On the rear of this straps the attachment metal strap is midssing Garde Reiter rank should straps are now extremely rare.. 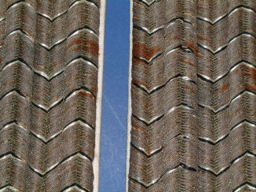 Both strap tops are in excellent condition. The undersides show some light moth tracking . A. 53 PRUSSIAN LIEUTENNANTS FIELD GREY PAIR SHOULDER OF STRAPS. 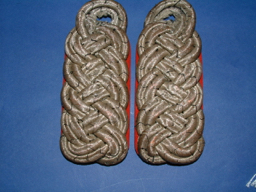 Pair of slip on type Prussian officers straps. White bases with grey wire tops flecked with black and white..In very good condition. There appear to be a series of punched through to the back though no sign of them to the fronts. A scarce original pair of Prussian Officers field grey straps. A. 53 BAVARIAN OBERLEUTNANTS FIELD GREY PAIR 106 REGIMENT SHOULDER OF STRAPS. 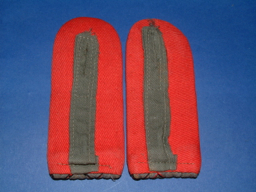 Pair of slip on type Bavarian officers straps. White bases with grey wire tops flecked with blue and white..In very good condition.Gilded 106 and a single rank pip on each strap. There appear to be a series of punched through to the back though no sign of them to the fronts. A scarce original pair of Prussian Officers field grey straps. 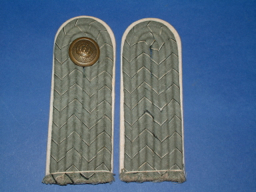 Pair of slip on type Prussian officers straps. Bright yellow bases with grey wire tops flecked with black and white..In very good condition. With applied cross cannons and a number 6 on each. 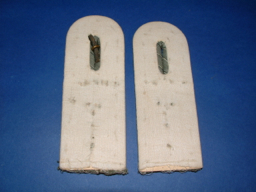 A scarce pair of Prussian Officers field grey foot artillery shoulder strapsstraps. A. 53B PRUSSIAN OBERLIEUTENNANTS 6th DRAGOONS PAIR SHOULDER OF STRAPS.